While I might not know what color the boathouse is at Hereford, I sure as hell drove the only Land Rover that was good enough for Judge Dredd. And the military-only 101 Forward Control delivers, up to two tons! I also drove a ex-racer Mark 2 Jag, an XK120 Coupe and even a C-Type with the googles and all, but honestly, who cares about me going slowly around a track with those when I can also tell you what’s it like to shake up the mud with a 101 Forward Control? 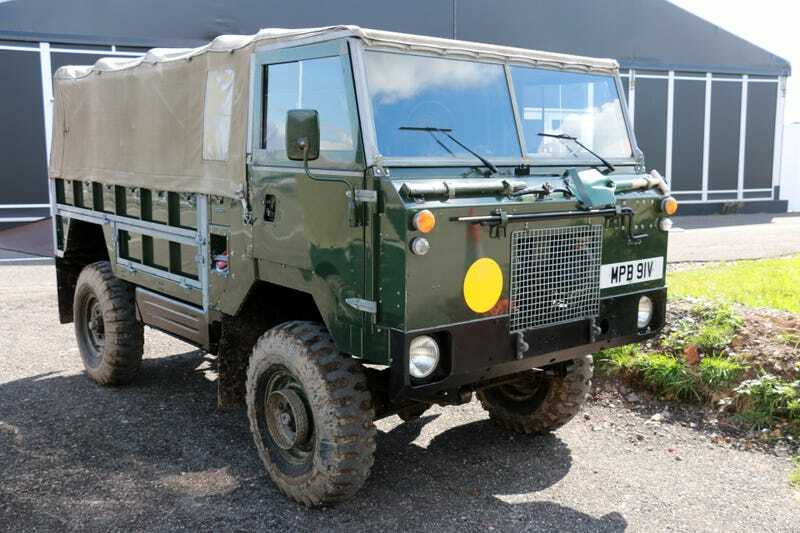 Climbing into a 101 FC was a huge deal for me because Land Rover only built 2,669 of these trucks between 1975 and 1978, and while many made it to abroad, it was designed and built primarily for the British Army and made available for the military only, be that British or Australian. Also, Judge Dredd a few years later. Powered by a 3.5-liter Rover V8, the Forward Control got its name from its wheelbase of 101 inches. It has permanent four-wheel drive and a vacuum-operated differential lock, both 12V and 24V variants were on the ordering list and they could tow anything up to two tonnes. That was necessary since most of them had to tow a L118 Light Gun, the artillery cannon known in America as the M119 howitzer. The 101 I drove was a left-hand drive 24V machine with a soft top. Land Rover produced the 101 in batches, and retained this example to make sure they have one to look at in case the army guys have any problems with theirs. This reference sample fitted for radio covered just 5,358 miles from new. Once onboard, the seating position feels weird at first, mostly because the steering column is almost vertical and the four-speed gearbox is tilted forwards, so the shifter is pointing straight ahead instead of upwards. Other than that, it’s as simple as it gets, all you need to remember is to steer later because sitting on top of the front wheels instead of behind them, obviously. Peter, my brilliant instructor who happens to be a real Land Rover veteran suggested we try the path without locking the diff first. Despite its size and the fact that we were rolling on Firestone sand tires, the 101 felt just as light on its feet as any old Land Rover. It might be made of slightly thicker metal all around, but that 3.5 V8 has more than enough torque to get it through an obstacle, especially when the truck is empty. If you pull the magic switch after you already pushed the red lever forward to get into low ratio, a light on the dash informs you that the inter-axle differential is locked. That makes your job even easier, but with a minimum ground clearance of 10 inches at the axles and super short overhangs at both ends, I didn’t get a chance to get into trouble. To disengage the lock, you need to drive in reverse a bit to let things slide apart. Details like that make this the coolest Land Rover ever, and the fact that you can jam all of your best friends in the back of it. Plus guns, grenades, mines, whatever you might need! The Ministry of Defence replaced their 101 fleet with Defenders and Pinzgauers in the late nineties, and since the Forward Control is possibly the most practical and capable off-roader money can buy, privateers made sure to save as many as they could. For Judge Dredd, Land Rover converted thirty-one 101s to be City Cabs of the not-so-bright future. Many of those survive and are in running condition to this day. Why wouldn’t they be? Land Rover built the Forward Control in the middle of the Cold War, and proper war machines don’t quit just because the world has moved on. They only become the toughest camper vans on the planet. We also didn’t call Land Rover UK Vehicle Assistance. There was no need.